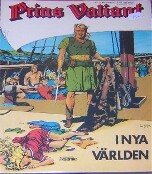 Prins Valiant, as our hero is called in Norwegian language. But who did print what with this serie? It's a mystery this far. I have the following pictures, and behind the title is the name of the printer on the cover and the year of print. So it seems that there are three different printers here. But are there also three different series? At least 14 books are printed but I didn't see copies of the same book with a different printer name this far. Values for all books are around 10 Euro's, except for the Interpresse one, that is 20 Euro. There is one special book printed by Interpresse, in their "Karat-serien (nr 5)". The title is "Ridderborgen" and it's a copy of The Mediaeval Castle. But the book also contains the "Song of Bernadette". Printed in 1978.